Vancouver, B.C........Corvus Gold Inc. ("Corvus" or the "Company") - (TSX: KOR, OTCQX: CORVF) is pleased to announce new drill and trench results from its summer exploration program at the Golden Range target area on its large Chisna Project located in south-central Alaska. The Company has been informed by its joint venture partner, Ocean Park Ventures Corp. ("Ocean Park") that six drill holes and four surface trenches were completed and results received for the Notch target, one of over a dozen targets within the greater Golden Range Target region (Figure 1). Highlights include 15.8 metres at 3.2g/t gold including 6.8 metres of 4.5g/t gold in drill hole GR-11-09 and 17 metres at 2 g/t gold including 5.1 metres at 4.6 g/t gold in hole GR-11-15 (Table 2). Results indicate that gold mineralization found at surface continues down dip for at least 250 metres. Summer exploration at Golden Range has now defined a 12 kilometre long area with a number of highly prospective gold zones with quartz-sulphide mineralization in veins and shear zones that have returned numerous surface samples over 10 g/t gold (Figure 1). The Notch Zone represents a particularly interesting target with a mapped strike length of 1 kilometre and many surface rock samples with grades in excess of 10 grams per tonne over a strike length of 900 metres (Figure 2). 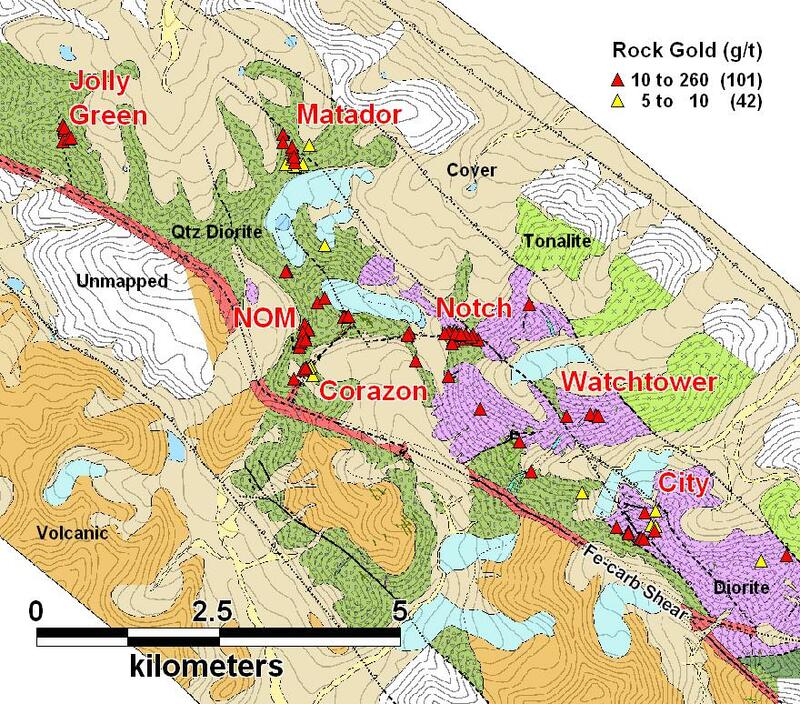 Figure 1: Geological map of the Golden Range Target showing major prospects and gold in surface rock samples. 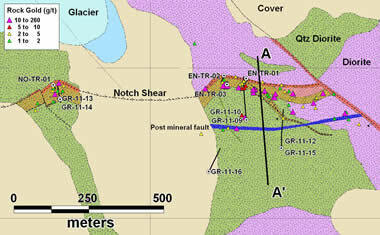 Surface mapping and trench sampling at the Notch has shown that mineralization is hosted in a shear zone 40-60 metres thick which dips 40-50 degrees to the south. The entire zone is altered and mineralized with higher grade zones of quartz-arsenopyrite hosted in specific intervals within the larger structural zone. At the Notch a total of seven holes totalling 1674 meters and four trenches totalling 104 meters were completed (Figure 2). Figure 2: Geological map of the Notch Target showing surface rock samples with drill and trench locations and traces. Trench EN-TR-01 encountered 47 metres with an average grade of 1g/t gold including 5 metres of 3.4g/t gold (Table 1). Trench EN-TR-02 near the footwall of the shear had weaker mineralization associated with the outboard alteration zone. Trench EN-TR-03 near the hangingwall of the shear returned 10 metres of 6.5g/t gold including an interval of 5 metres of 13.2g/t gold highlighting the zone's high-grade potential. Trench NO-TR-01on the western extension of the structure was 16 metres long and had only low grade mineralization (Table 1). Table 1: Significant Intercepts* from Surface Trenching at the Notch target. A series of holes were drilled to test the down dip extension of the surface shear zone. Hole GR-11-09 encountered 16 metres of 3 g/t gold including 7 metres of 4.5 g/t gold with several other intervals of significant grade in a 60 metre thick shear zone (Table 2, Figure 3). 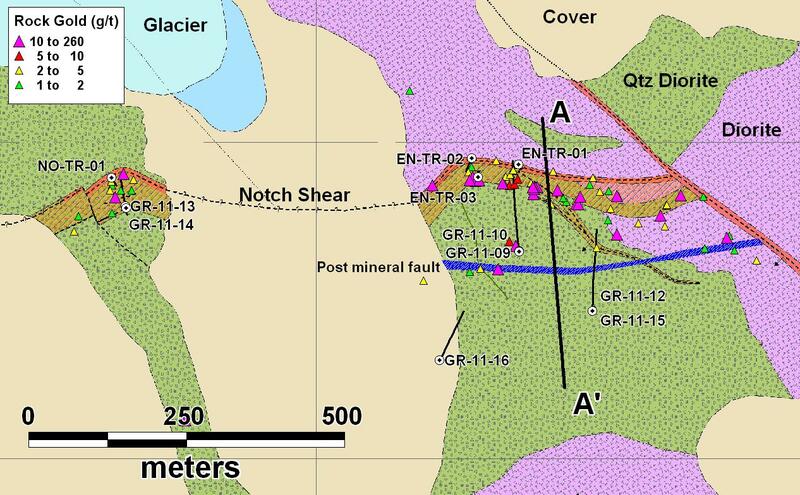 Similarly, hole GR-11-15 encountered 17 metres of 2 g/t gold including 5 metres of 4.6g/t gold also in a 60 metre wide zone of alteration (Figure 3). Unfortunately holes GR-11-10 and GR-11-12 encountered a significant fault zone and were lost before hitting the mineralized zone. Holes GR-11-13 and GR-11-14 in the western extension both encountered 10's of metres of continuous lower grade mineralization. These drill results show that gold mineralization in the Notch Shear continues for at least 250 metres down dip and that the high grades encountered at the surface can be found at depth. At present a detailed structural analysis is underway to better predict the distribution of higher grades zones within the larger shear zone at the Notch. In addition the other high-grade gold targets in the Golden Range area are being further analyzed and drill targeting is underway. Table 2: Significant Intercepts* from Drilling at the Notch target. *Intercepts calculated using a cut off of 0.1g/t gold with maximum 3m of internal waste. This press release contains forward-looking statements and forward-looking information (collectively, "forward-looking statements") within the meaning of applicable Canadian and US securities legislation. All statements, other than statements of historical fact, included herein including, without limitation, statements regarding the anticipated content, commencement and cost of exploration programs, anticipated exploration program results, the discovery and delineation of mineral deposits/resources/reserves, business and financing plans and business trends, are forward-looking statements. Although the Company believes that such statements are reasonable, it can give no assurance that such expectations will prove to be correct. In addition, information with respect to the proposed activities of Ocean Park on the Chisna property has been provided by Ocean Park (the operator of the Chisna joint venture) and, as such activities are not within the control of the Company, the Company takes no responsibility for the accuracy of such statements. Forward-looking statements are typically identified by words such as: believe, expect, anticipate, intend, estimate, postulate and similar expressions, or are those, which, by their nature, refer to future events. The Company cautions investors that any forward-looking statements by the Company or any of its joint venture partners are not guarantees of future results or performance, and that actual results may differ materially from those in forward looking statements as a result of various factors, including, but not limited to, variations in the nature, quality and quantity of any mineral deposits that may be located, variations in the market price of any mineral products the Company or its joint venture partners may produce or plan to produce, the inability of the Company or any of its joint venture partners to obtain any necessary permits, consents or authorizations required for its or their activities, the inability of the Company or any of its joint venture partners to produce minerals from their properties successfully or profitably, to continue its projected growth, to raise the necessary capital or to be fully able to implement their respective business strategies, and other risks and uncertainties disclosed in the Company's latest interim Management Discussion and Analysis and filed with certain securities commissions in Canada. All of the Company's Canadian public disclosure filings may be accessed via www.sedar.com and readers are urged to review these materials, including the technical reports filed with respect to the Company's mineral properties.